On Tuesday, December 23, at approximately 2 PM, a confrontation developed between several dozen Palestinians and soldiers in the Special Security Area (SSA) surrounding the settlement of Carmei Tzur, south of Beit Umar in the occupied West Bank. The area is the site of frequent confrontations between soldiers and Palestinian residents of Beit Umar, whose land was expropriated for the settlement and the SSA. The SSA, which is supposed to serve as a buffer zone that no one but security forces may enter, was established on privately-owned Palestinian land. The owners need to obtain a special permit to reach and cultivate their land, but such permits are issued for only several days a year. In contrast, security forces allow settlers free access to the expropriated land. During the confrontation, Palestinians threw stones at soldiers, who responded by firing crowd control weapons. At around 3 PM, about an hour after the incident began, two soldiers arrived on the scene with two dogs, as was captured on video by B’Tselem volunteer Muhammad ‘Awwad. According to eyewitness reports, one of the dogs (seen lunging forward at the beginning of the footage) attacked and bit one of the Palestinians confronting the soldiers, 16-year-old Hamzeh Abu Hashem. 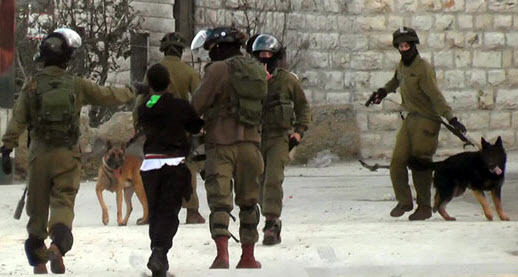 The soldiers then withdrew the dogs, handcuffed Abu Hashem, and took him to the settlement of Carmei Tzur. From there, he was taken by am bulance to an Israeli hospital. Abu Hashem’s family reported that he was arrested and taken from hospital to the Ofer Prison. The video footage filmed by B’Tselem volunteer Muhammad ‘Awwad.